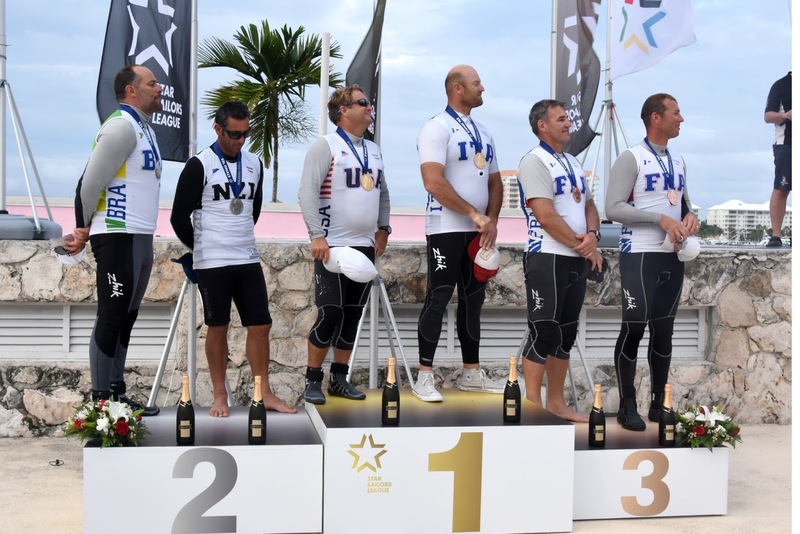 The 2015 Star Sailors League Finals came to a dramatic conclusion today in the tactically challenging sublime waters of Montagu Bay, Nassau. Eleven teams with world class sailors from eight different countries contested the knock-out format of three races. Between the 22 sailors, they had totalled 28 Olympic campaigns and over a dozen America’s Cups. The range of sailors was phenomenal; Jochen Schümann won the first of his three Gold Olympic Medals over 40 years ago, rising French Laser star, Jean-Baptiste Bernaz was not even born when Jochen Schümann stepped onto the podium of the 1976 Olympic Games, winning Gold in the Finn. Ten teams competed in the Quarter Final, Rohart & Ponsot (FRA) had won the qualifying rounds and received a bye for the first knock-out race. Szabo & Natucci (USA/ITA) took the gun but there was a tremendous battle the last qualifying spot. Negri & Lambertenghi (ITA) finished just out of the top seven, with Cayard & Sharp (USA) claiming the last qualifying place after a spectacular last downwind leg. Kusznierewicz & Zycki (POL), Williams & Mitchell (GBR) and Schümann & Borkowski (GER) were also eliminated. The Semi Final featured seven teams: the top six from the Quarter Final plus Rohart & Ponsot (FRA). Polgar & Koy (GER) led the magnificent seven to the first top mark, Rohart & Ponsot had a great first downwind leg to take up the running but, by the end of the last upwind leg, Pepper & Prada (NZL/BRA) had built a substantial lead which they did not relinquish. Szabo & Natucci (USA/ITA) and Polgar & Koy (GER) joined Pepper & Prada and Rohart & Ponsot in qualifying for the Final. Bernaz and Rambeau (FRA), Stipanovic & Canali (CRO/ITA) and Cayard & Sharp (USA) were eliminated. Four teams contested the final with the winner receiving a $40,000 slice of the $200,000 Prize Purse. There was drama right at the start with Pepper & Prada (NZL/BRA) and Rohart & Ponsot (FRA) ordered to do penalty turns by the on-the-water Jury. There was even more drama as Polgar & Koy (GER) on port tack, tried to cross the bow of Szabo & Natucci (USA/ITA) and didn’t make it, taking a penalty turn. Pepper & Prada (NZL/BRA) had speared off to the less favoured right side of the course, and got into really good lifting pressure, to make it to the top mark in first place by less than a boat length from Szabo & Natucci (USA/ITA). At the next mark Szabo and Natucci made a perfect rounding to get into phase earlier to take up the lead but back came Pepper & Prada to regain the lead on the penultimate leg. However, there was one last twist. Pepper & Prada (NZL/BRA) gybed to the middle of the course on the final downwind leg, whilst Szabo & Natucci (USA/ITA) stayed out to the Rose Island side of the course. This turned out to be a winning move by Szabo & Natucci, who took the gun and the win for the 2015 SSL Final by a boat length from Pepper & Prada. 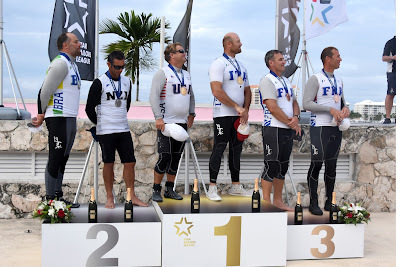 Rohart & Ponsot (FRA) completed the podium to take third place and Polgar & Koy (GER) were fourth. “I have mixed emotions, we had everything we needed to win this event: we had speed, confidence, knowledge, we felt the wind very well, we were there we made a mistake in the start, I was too aggressive, so it is my responsibility. There was a slightly collision between us and Hamish, we didn’t complain but the umpire waved a red flag for both of us. Next event will be in Hamburg from 2nd to 6th May 2015, for the first ever SSL City Grand Slam.